Swimming fast or working on your speed is a very important physiological element, our goal is to know how to swim fast without hurting and causing pain 6 hours after the swimming workout which means pain is good when speeding up, but the question is if the pain stays with us or goes away and builds up our muscles? **the dangerous thing in speeding drills is that if you don’t do it correctly you can hurt your neck & shoulders. 1. How to swim fast? 2. To control the number of strokes in the first & second 25 m in a 50 m? 3. To know how to increase your swimming pace and control your swim in the same number of strokes? 2 5X50 freestyle with fins increasing number of dolphin kicks in the first 50 you kick 5 dolphin kicks and continue freestyle, second 50 exactly 6 kicks.......last 50 , 9 dolphin kicks. 4 8X50 reduce number of strokes in the second 50, 4 in freestyle, 4 in a different style(Medley is possible as well) in the first 25 m you will swim as fast as you can and in the second 25 reduce exactly 4 strokes. 5 5X200 on 5 min send of time (which is allot) 50 m Allout look at the time and continue 150 as slow and long strokes. **you can choose a stroke but don't change it in all the 5 fast 50, your goal is to do the same time in all 50. 50 Allout with a jump in a different style. All rights are reserved to WEST Swimming Technique, Masters Swimming workouts are free. By downloading and using a workout you take full responsibility on yourself in case of any damage or health issue occurring during and after the swim lessons, workout, or other. 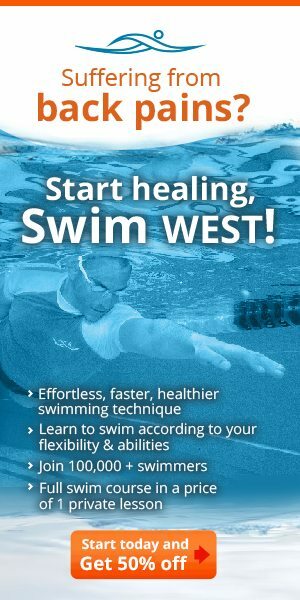 It Is always recommended to start your west swimming online program before working on speed, In WEST swimming technique you will learn to swim freestyle and protect your lower back.